I keep asking myself this question as I read ever more commentary from media pundits and bloggers who are all condemning the killing of 12 people in Paris, France on January 7, 2015: You study religion and satire, can you make sense of this Charlie Hedbo…what do we call it now? Is it an event? An “affair”? Or an incident, case, example, tragedy, cataclysmic turning point of European history, occurrence in an ongoing skirmish between different cultures that will inevitably clash until one is wiped out, or, yesterday’s news? As we move further and further from the event (and it has only been a month), the heat of the moment seems to have subsided, but long term questions remain, such as “What is satire’s role in a modern free society?” and “What is “religion’s”? What lessons are there to learn from this event so soon after the initial burst of activity has subsided? 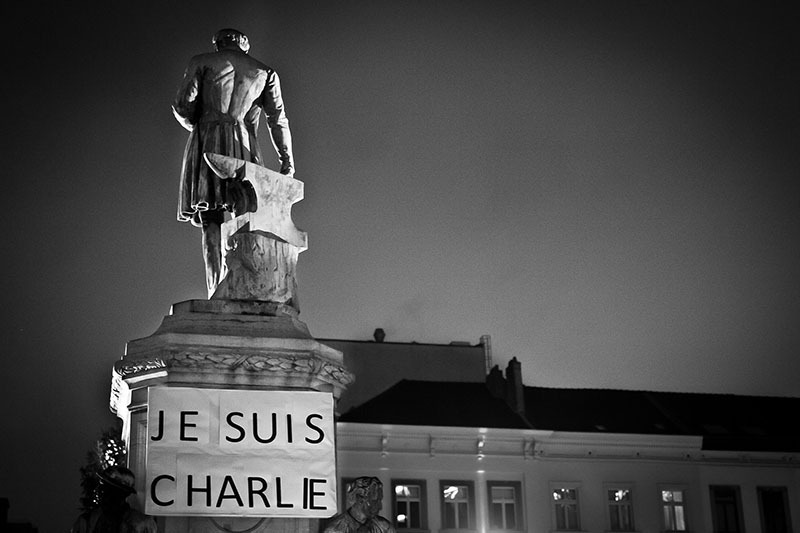 “Je Suis Charlie.” Photo by Brian Solis on Jan 9, 2015. Available via Flickr. Of course, I think that violence is a gross overreaction to satirical drawings. In writing that statement, I am becoming an example that helps prove a larger point that I will get to in a moment. You see, satire is a tool and it is a neutral tool. It is telling jokes about somebody who falls short of our moral compass. It is not, as Tim Wise suggests, about attacking people in power. It can be, but it is not inherently. Some satirists draw things that I find repugnant (see for example, the fourth chapter of Eliot Oring’s book Engaging Humor for an excellent discussion of the humor of hate), but they are still satirists. They are creating humor so that people will laugh at targets that fall short of some moral standard. Some tell their jokes to try and get people to change their minds. They want to encourage others to see their foolishness and change their behavior. Maybe that’s what Charlie Hebdo’s humor was about. 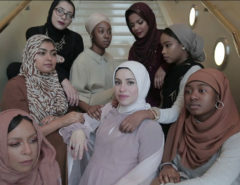 The visual images also suggest a more complicated relationship with Muslims and their role in French culture than simply saying that this is an assault on radical Islam or Muslim “fundamentalism” (a claim that seems to be repeated with the “equal opportunity offender” defense of saying that they also satirized fundamentalist Christians and Jews). That is to say, there is a question about whether or not one can be fully French with an ideological commitment to a tradition that is not “French”, a tradition which is constantly marked upon the bodies of those who appear “Other” along with images which link the bodies of those who are in question with the religion’s founder. I suspect that this is not just a question of the Prophet and his teaching. 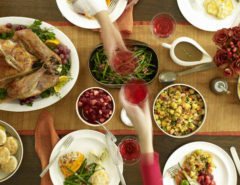 Rather, it is a question of how several factors — ideology; personal identity; national, cultural, and political contexts; and larger systematic struggles among different groups of human beings to carve out a sense of security in the world — coalesce to create an ontology for other people and impose it upon them in everyday acts of micro-aggression and labeling. I hope that somebody more versed in French religio-ethnic politics will either correct me and tell me I am completely wrong or build on this hypothesis to illustrate its nuances. 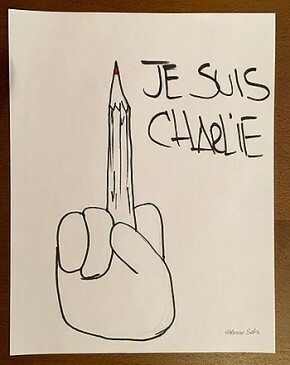 Either way, Charlie Hebdo was, at least to me, one example among many different caricatures of Muhammad and Muslims. If you were to show me the images on January 6th, I probably would have said that they were interesting and left it at that. Or maybe I would have been indifferent to the cartoons, as their main significance when I tried to examine them as examples of religious satire, was their repetition and unoriginality. 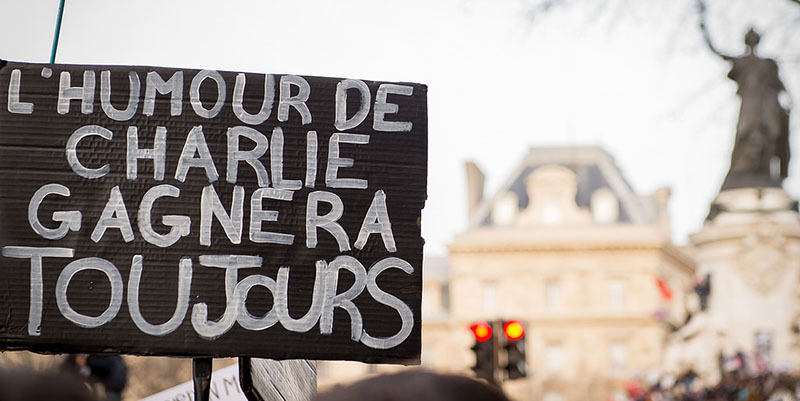 Either way, Charlie Hebdo is now something more than it was before the attack. “Graff à la mémoire de Charlie Hebdo: Graff de mr.R et papagibs en hommage aux victimes de l’attentat perpétré contre Charlie Hebdo. Portraits de Charb, Wolinski, Cabu, Tignous et Bernard Maris. 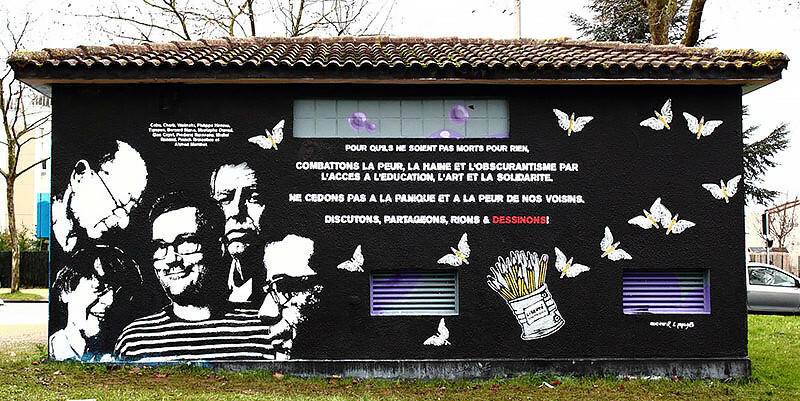 Poitiers, janvier 2015.” (A tribute mural to Charlie Hebdo’s cartoonists by graffiti artists mr.R et papagibs.) Photo by ID Number THX 1139, Jan 10, 2015. 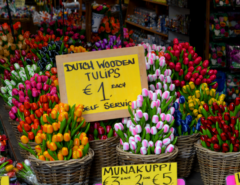 Available via Flickr. Yet, I return to my initial condemnation of the actions even though such condemnation would have meant nothing to the Kouachi brothers who did the shooting for their ideological backers. I do, however, have to engage what Fredrick deBoer has pointed out are “dead moral questions.” In order to do my job as a professional academic and try to draw our attention to larger patterns of social significance, I first have to make tribal statements to show that I understand and support the basic moral and social expectations of me as a citizen so that my audience can see me as aligning myself with the values others are claiming were attacked in the shooting. I am engaged in a small act of culturally rebuilding what was ostensibly destroyed in the assault. In all honesty, I am consciously joining in the many acts of reasserting the sacredness of the values upon which Western “secular” states are ostensibly built. That is, like those who immediately started posting under the #JeSuisCharlie hashtag on Twitter, writing that they “stand with” Charlie Hebdo on Internet message boards, and who gathered in public spaces for rallies that stated their difference from those who used violence to try and “avenge the prophet,” I am stating my solidarity with those who agree to certain moral principles and simultaneously saying I am not like those who do not. I am, in part through this piece, sacralizing an idea of free speech, or, more to the point, the freedom to speak without having to fear violent repercussions for my actions. 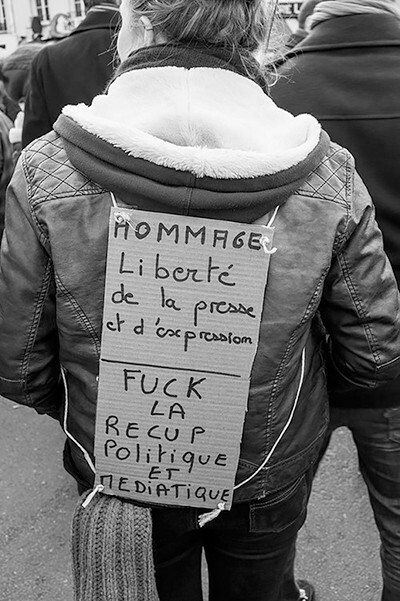 “Marche républicaine du 11/01/2015 à Paris Charlie Hebdo.” Photo by Kunirosawa on Jan 11, 2015. Available via Flickr. A more significant thing arising from this attack is the way that it brought people from numerous nations that see themselves as somehow “free” and endowed with certain basic “rights” to state publicly that they were opposed to the shadowy forces that ostensibly “hate us” and cannot abide by freedom of speech. While this particular case leads to questions of Muslims who are willing to use violence and fear to affect others into acting in ways the violent Muslims find desirable, as others have pointed out, different nation states have ways of silencing people who speak about things they do not like and their methods can involve prison time and torture—actions which are violent. Indeed, these states are powerful and the modern nation state has, as a basic definition of its existence, the legitimate authority to protect itself through violence on its citizens or those outside its borders. When officials find themselves threatened, the state’s power is often at their disposal. I am not, however, stating anything new, and for the thousands of people who have stated solidarity with Hebdo, I’m not sure that it matters. This ability to silence free speech, and do so while rallying others to the values the state supposedly supports, is what is so significant about the shooting’s aftermath. The Unity Rally in Paris on January 11, 2015, was attended by an estimated 1.5 million people, with rallies across France drawing over 3 million. Pictures from the event show jammed streets with people holding pencils and “Je Suis Charlie” signs. French flags are prominent. Marching at the head of the rally were heads of state and/or their representatives from over 40 nations and major international organizations such as the European Union and NATO. Reporters Without Borders (RWB) was quick to point out that not all of them (they identified Turkey, Egypt, Russia, Algeria, and the United Arab Emirates) practiced freedom of speech and were currently jailing journalists for speaking out on a variety of issues. So why was it important that they were there and marching with other leaders of major nation states? I think it is to publicly associate themselves with the power that comes from associating oneself with an opaque symbol such as “freedom of speech” in a ritually charged environment in which millions of people are affirming that “freedom of speech” is something that is representative of “good” people and nations. This observation builds on sociologist Emile Durkheim’s work in The Elementary Forms of Religious Life, but this particular example shows a connection between the ideological and symbolic significance of “freedom of speech” and its association with the nation states represented by the political power players who led this public demonstration. Every little act of support for the value of freedom of speech—such as the statements in this essay and the claims that satire such as Charlie Hebdo are essential for Freedom of Speech—is collectively affirmed in the ritual moment. As citizens who are aware of this event’s symbolic elements and its political significance we should be wary of the fact that first a large security force and then the political representatives led the march. This is vital because the symbolic energy that arises from communal assent passes to those with the power and now the sacred authority to destroy those who are seen as threats is legitimated in such collective acts. State authority is now given a cosmic significance of protecting this supreme value that has been collectively affirmed as those murdered are turned into martyrs in the political process of interpreting the larger significance of acts such as the shooting. RWB was right to question some leaders’ participation, but the criticism comes after the sacredness has been conferred. RWB is trying to desacralize the leaders, showing their logical contradictions, and fighting a battle over the freedom to openly criticize those in power through the press. They are trying to use freedom of speech’s sacredness to get journalists who are wrongfully imprisoned released. RWB’s actions unveil the tenuousness of mitigating sacred values in the political sphere. To assent to an idea in its totality, to be able to speak freely (and by implication, without fear of unlawful reprisal), is to live under the full moral weight that is also ascribed to when sacredness is made. The march exposed such contradictions, even as it helped regenerate the sacredness imbued in the concept of freedom of speech. Yet, in the contradiction between ideal values and the everyday world, we see new openings and new fractures that invite daily introspection and acts of resistance to preserve freedom of speech. When journalists are jailed, when those who challenge power are summarily dismissed instead of having their evidence evaluated fairly, and when governments use violence to control dissent at home and abroad, then the sacredness being affirmed in such rallies is being put to ill use. 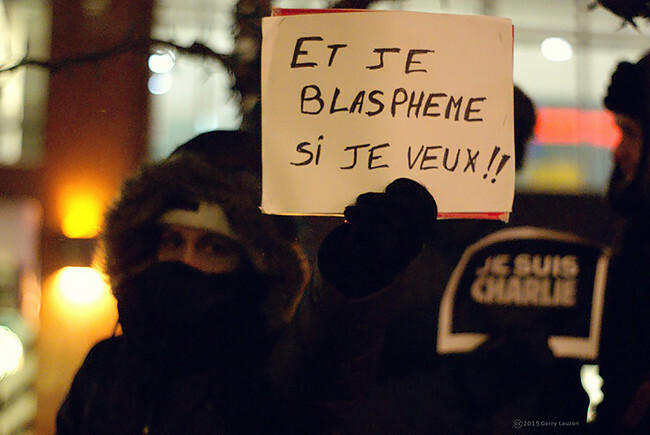 “Rien à foutre: Taken at the vigil in front of the French consulate in Montreal on a -26C evening.” Photo by Gerry Lauzon on Jan 7, 2015. Available via Flickr. This is where satire becomes, once again, important. To be able to expose these contradictions, laugh at their absurdity, and then mobilize against those who would repress the people who try to live up to the high stakes we have imbued into our symbolic values such as “freedom of speech” is the moral activity satire facilitates by exposing contractions in moral logic. There are real people being killed, there are real people imprisoned, but those with the power to at least free jailed journalists are marching at the head of unity rally for free speech and being protected by a well-armed police force. Such moral contradictions are the satirist’s lifeblood. The question that I think those who affirm freedom of speech should be asking is, if they will allow political leaders who repress freedom of speech to take the symbolic power they gained from participating in the rally and use it to bolster their political power without challenging them on the contradictions between their support for free speech and their actions against it. If we do, then the system that supports freedom of speech—the laws and lawmakers, the protective police forces, the venues in which freedom of speech is practiced—are legitimated no matter how difficult it can be to deal with the things people say. This is where satire and freedom of speech become sacred matters of everyday life in a human society—when the sacredness ascribed to a value is attached to a position of power it needs to be kept in check lest it be overwhelmed by the ambitions of the person in the powerful position. Satire is at its best and most effective when it shows people’s moral failures while also affirming a moral’s value. I do not know if Charlie Hebdo does that, but to not take that spirit with us in all we do when considering any ideological position, political movement, or individual action in the world is a poor way to honor both satire’s spirit and freedom of speech. * I would like to thank my colleague Kimberly P. Brackett for her comments on an earlier version of this essay. David Feltmate is an Assistant Professor of Sociology at Auburn University at Montgomery. His work specializes on the sociology of religion, the sociology of humor, and religion and popular culture. He can be followed @DavidFeltmate.